While I didn’t spent Christmas or New Years in Colombia, as a teacher of culture and language I unavoidably discussed family holiday traditions with my students, and also learned a little about holiday traditions in Colombia from those in my teaching program that decided to stay in Colombia for the holidays. What happens in Bogota for Christmas? Well, before Christmas, there are large displays of holiday lights that go up in the “parks” in downtown Bogota. Being a mainly Catholic country, it isn’t surprising to see light displays of the three wise men bringing gifts to baby Jesus or an actual nativity scene sitting out on public property. 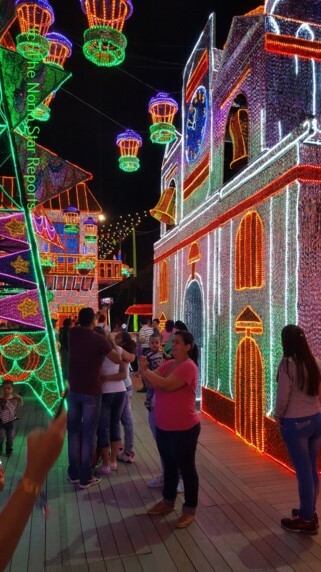 Bogota and Medellin are the two cities best known for their Christmas lights and decorations, though Medellin is said to have such a good lights display that people often travel to the city just to see them. I’m not entirely sure if it’s considered a tradition, but from living in Bogota during the days before Christmas I can say that Christmas hats are a very big thing. Many of the street vendors in Bogota switch out their stock based on the season, and for Christmas they invest heavily in crazy Christmas hats that light up and feature little bells at the end. 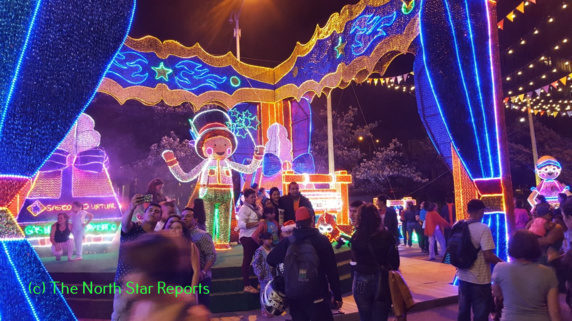 If you walk down the Septima (one of the major streets in Bogota) in the evening, you’ll see families out for a walk with each of the children wearing a long stocking cap striped with red, green, and white, or a hat with a giant waving, light-up snowman. As for during Christmas, many Colombians I’ve met jokingly say that nothing happens in Bogota for Christmas. The reason? Everybody in Bogota travels wherever else possible during the holidays. Bogota is one of the coldest large cities in Colombia, so warmth and sun is often the goal and huge amounts of families travel to the coast (Cartagena, Cali, Santa Marta, and Barranquilla) during the holiday season. The coast is packed, and prices skyrocket in the December-January season for flights and hotels. In contrast, prices for Bogota hotels in December are nearly halved. A hotel that is usually 150,000 pesos a night (about $50 USD) will drop to 90,000 pesos (about $30 USD). About our special correspondent Laura Blasena: Ever since I was a little Kindergartner I’ve always wanted to be a teacher. I graduated from St. Scholastica in the summer of 2015 with a double major in Elementary Education and Spanish Education after student teaching as a 5th grade teacher and also as a Spanish teacher at NorthStar in Duluth, Minnesota. While my future plans before graduation were initially to become a classroom teacher, I decided to wait a year to begin teaching in the United States and have chosen to work as a Fulbright English Teaching Assistant in Bogota, Colombia. In Colombia, I will be working with a university as an assistant in the language department, attending classes, running conversation clubs, and offering the perspective of a native speaker. I’ve always loved to travel. In college, I participated in several study abroad trips, visiting England, Guatemala, and Mexico. (I loved visiting Mexico so much that I even went back a second time!). I’m looking forward to the travel opportunities that I will have while working and living in Colombia. The North Star Reports: Global Citizenship and Digital Literacy (http://NorthStarReports.org) is a student edited and student authored open access publication centered around the themes of global and historical connections. Our abiding philosophy is that those of us who are fortunate enough to receive an education and to travel our planet are ethically bound to share our knowledge with those who cannot afford to do so. Therefore, creating virtual and actual communities of learning between college and K-12 classes are integral to our mission. In five semesters we have published 200 articles covering all habitable continents and a variety of topics ranging from history and politics, food and popular culture, to global inequities to complex identities. These articles are read by K-12 and college students. Our student editors and writers come from all parts of the campus, from Nursing to Biology, Physical Therapy to Business, and remarkably, many of our student editors and writers have long graduated from college. We also have writers and editors from other colleges and universities. In addition to our main site, we also curate a Facebook page dedicated to annotated news articles selected by our student editors (http://www.facebook.com/NorthStarReports). This is done by an all volunteer staff. We have a frugal cash budget, and we donate much of our time and talent to this project. We are sponsored by St. Scholastica’s Department of History and Politics and by the scholarly Middle Ground Journal: World History and Global Studies (http://theMiddleGroundJournal.org). Hong-Ming Liang, Ph.D., Editor-in-Chief and Publisher, The North Star Reports; Chief Editor, The Middle Ground Journal; Associate Professor of History and Politics, The College of St. Scholastica. Kathryn Marquis Hirsch, Managing Editor, The North Star Reports. Reblogged this on The Middle Ground Journal. Reblogged this on Professor Liang 梁弘明教授. It’s fascinating to think of Christmas across the globe. The way in which people celebrate a festival/holiday is a huge indication of where a person is raised and what a family believes in; which in turn indicates where a family may have originated from. So cool! Thanks for your writing, I feel like I learn more and more about Bogota every time. It would be interesting to see many religious symbols on public property instead of just light. The differences are really cool! The wearing of hats seems like such a small thing, but little differences sometimes are the most interesting to see. The similarities are also really cool to look at. The lights and traveling for the holiday to somewhere warm just go to show that people all over like similar things. What are “cold” temperatures to Colombians, or at least the ones you conversed with? Whatever the average temperatures are there during the holiday season, I imagine they are heavenly compared to those in Minnesota. Christmas hats, I wouldn’t see that coming as a gigantic sales product. Did you buy one to fit in with the crowd? While the locals joke that nothing happens in Bogota during Christmas, I’m sure it’s bustling and busy compared to Duluth around Christmas! It is nice to hear about the different Christmas traditions somewhere other than the United States. I think it’s kind of funny that people don’t stay in town for the holidays. When you think about it, a lot of people in the US travel as well. However, I don’t think people travel in the US to get to warmer weather (while I know that some actually do do this), so that was interesting to read. It’s always interesting to read your stories! Hearing about Christmas traditions out side of the United States always surprises me. I think because of how commercialized it has become in this country I often associate it with a national holiday in my head. However, Christmas in Bogota sounds beautiful and exciting, well before everyone leaves. I hope you enjoyed that time of year there and thank you for sharing! It is difficult for me to imagine a Christmas without snow, so it is interesting that many travel to warmer places for the holidays. What temperatures do the “cold” in Bogota range from? The pictures you included look amazing! What an awesome, and somewhat familiar (but also different) with light displays, Christmas/Holiday tradition. Holiday celebrations around the world are so very different which I find so fascinating. When I came to study in the United States I was unable to go back home for my first Christmas break. The holiday was celebrated completely different. First of all, in Latin America families gather the 24th rather than the 25th. Second, food is ver very different – we do have turkey and ham but also traditional cuisine such as tamales. Third, ALL of the family comes together – not just siblings and parents but uncles, aunts , second cousins, your family close friends – literally everyone you know is there. I think it would be an interesting place to be during the holidays. I think the Christmas hats would be a lot of fun to wear around, kind of like ugly Christmas sweaters! Are the light displays similar to what we have here, where a group will put up large drive through displays, or is it more like Bentleyville where you can roam around? Bogota seems like it would be a cheap Christmas destination for those who are from places with even colder weather. Christmas traditions are going to be different and similar around the world. Holidays are a time where we are able to connect cultures far and wide. Because of immigration and migration from years past these holidays are similar throughout the world. It is very interesting to be able to go to a different country for a Christmas vacation and find similar celebrations as of your own country. Now, I have always been with family for the Christmas holiday and have not experienced it in other countries, but that would be exciting. It may just be simple things like the Christmas hat that is unique to a country; what do you think the United States unique trait about the Christmas holiday is? Or Minnesota? The way that certain places celebrate holidays along with their traditions are always fascinating to learn about. It is nice to see that there are Christmas lights all over as well. Interesting point made that people want to travel to where it is warmer during Christmas. The part about the popularity of Christmas hats are great to hear about. It is always interesting learning how other areas around the world celebrate Christmas. Culture to culture there are so many differences yet some things stay constant. In Bogota you discussed the great amounts of lights they showcase all around. In the U.S. I find that we have that similar tradition by putting up our Christmas lights. As well as various cities putting up light shows like here in Duluth they set up Bentleyville. I find it odd that many of the people living in Bogota leave during the holiday season for somewhere warm. For me Christmas and that time of the year is spent with a lot of family. Visiting with extended family, and celebrating the holiday. It is always fun to see how other people spend the holidays and create traditions of their own. It is so interesting to see how certain places are similar and different. My favorite part of the holiday is driving around and looking at all the Christmas lights and decorations. It is also interesting that even there people leave to warmer climates for the holiday. I personally could not imagine Christmas without snow! I also loved the idea that they all wear crazy Christmas hats… what a cool and funny tradition. Thank you for sharing! This was such a lovely read! 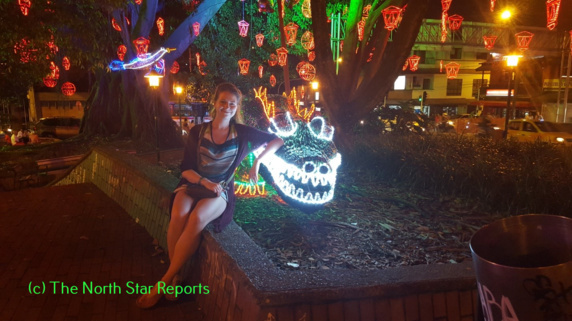 I really enjoyed the light displays of animals “(Medellin’s Christmas lights feature alligators and hippos)”. I think seeing what put up for lights (if they do) is really fun and fascinating as some stick with more traditional means (candles in the windows), the more modern style (music interactive lighting), or settle in-between. I also enjoyed hearing about the hats that are sold; they sound so magical and cute. Your article made me think of my time in Norway in two ways. One being the Christmas markets that opened at the end of November and how that contained a mixture of traditions and more modern things. Two being traveling away during the holiday/winter season in order to escape the cold weather –though in Norway, no matter where you are actually going– you are vacationing in the South. Thanks for sharing such a lighthearted and fun read! I think one of the best experiences while travelling is getting to see the different holidays or traditions. Even though countries may celebrate the same holidays, such as Christmas, the way in which they celebrate it will always be different and such a cool thing to learn about. Seeing these celebrations first hand are so much more meaningful than reading or learning about them and they always offer a look into the culture that may not have been seen before. I find it amazing how people celebrate Christmas around the world, as we all are celebrating the same thing but in such diverse ways. Their light shows and decorating seem so beautiful. I found it interesting they all plan to leave their home around Christmas because of the weather and here we all come home and get together instead of going away to warmer places. One thing I found crazy was the price of their hotels, $50 US dollars for one night, compared to $150 here in the United States. Best of luck to you and your travels! It is always interesting to read about the many different ways Christmas is celebrated across the globe. What stands out of course are the many different traditions the people of Colombia have compared to the traditions we have in the US, of course because we have different cultures but it is still interesting. The idea of Christmas hats is something that needs to come to the US I would love to see the streets filled with people wearing crazy Christmas hats. The idea of the lights and how the cities go all out reminds me of Duluth with Bentleyville. Great Article! I have experienced Christmas outside the US as well when I was on a yearlong exchange in Brazil. I found it extremely interesting to see how a different culture celebrated a pretty universal holiday. However in my experience it was one of the hottest days of the year which really threw me for a loop being that I had never experienced a warm Christmas. Also the way that we gave and received gifts was totally new and unexpected, you picked a gift said something nice about the person it was for and then they proceeded to do that for a gift that they chose… Etc. Overall it was a wonderful and enlightening experience that showed me that something so universal can be celebrated in so many great ways. The streets lined with buildings lit up is very beautiful! That makes me want to go to Columbia and experience Christmas there. I was in Mexico for New Years one year and the celebration was that similar to Time Square and large hats similar to that of Bogota, so it would be cool compare and contrast both Bogota’s celebration and that of the United States. Those buildings remind me of my house during the Christmas time where my dad puts up 17,000 lights! Makes me wonder home many are on that one street alone. That must be a completely different experience celebrating a christmas in a warm culture as opposed to a cold one! As you mentioned, I would imagine traditions would be largely different. As opposed to simply decorating the streets primarily with lights, the warmth opens the door to create full on scenes as well as for people to buy special clothing to wear around. That is something you do not see in cold climates as it is often way too cold to even think about spending significant periods of time outside! The idea of what constitutes as “cold” is interesting to me because it is relative to location. Cold can mean something completely different to Colombians than it does to us here in Minnesota. The idea of the hat was interesting because, “When in Rome, do as the Romans do”. The relativity of the hustle and bustle of Bogota compared to that of Duluth, you could be the only one that realizes it because others don’t know anything to compare it to. Really interesting to see Christmas from another culture’s perspective. I find that it’s very easy for me to forget how different things can be all over the world, and that I often find myself just assuming subconsciously that everyone must see holidays and other events much like we do in North America. The alligator especially caught my eye as something so different that although I know of and have seen many alligators it had never crossed my mind to include one in a festive holiday before. It’s interesting reading about the culture of Christmas in other countries and comparing it to the United States. The part discussing the lights in the parks of Bogota reminds me of Bentleyville here in Duluth. Also the concept of Christmas hats was one I found interesting. I related this to the idea of American’s growing to make Christmas sweaters more and more of a tradition. That is very surprising that being Bogota is so huge in the Christmas and New Year spirit that they don’t even stay around for it. Its also interesting to see how other places around the globe celebrate different holidays. I think we some times tend to assume that everyone does things the same way, but that isn’t the case at all. I thought that a cool similarity between Bogota and Duluth is that they both provide light shows, where people are willing to travel to see them. Although Bogota seems to take the cake for a larger scale presentation. Its wonderful to see differences and similarities between countries that are so different. Interesting how a cultures from around the world that celebrates a holiday can be so different, but also the same. The businesses all heavily invest in the holiday to get themed products. I would find myself at a loss if I were to try to go to the beach and weather where I could wear a T-shirt. I have always been near snow a below freezing. Thanks for sharing! I am fascinated how other cultures celebrate Christmas. I am curious as to how Christmas even become a holiday for other countries especially if it wasn’t traditionally in their culture to begin with. I am a huge fan of Christmas lights and would love to visit Bogota just to see the decorations. I think it is very generous of Bogota to lower their hotels’ rates! This shows that it is not always about the profits that are important to them when it comes to celebrating a holiday, but the entertainment and joy they can bring to the people! Christmas is one of my favorite times of the year and I have always found it fascinating to hear how other cultures celebrate the holiday. I was lucky enough to celebrate an “American” style Christmas and a traditional “Danish” Christmas. The main difference that I have noticed between the two, is that the Danish Christmas was more about family and beliefs, whereas my experience with an American Christmas was more about the commercialism of the holiday. It is amazing to me how into Christmas the Danish are and all of the events they have correlated with the holiday. I have only experienced a Danish Christmas within my mother’s home but I would love to one day experience it in Denmark. Christmas in Bogota sounds very exciting. I like how they focus more on the family, traditions, and customs rather then a heavy commercialized holiday like we tend to do with gifts and big meals. I have only spent Christmas outside of the U.S one time and it was for a family vacation in Mexico. It was interesting to see all of the partying and cheering that they did. In a sense, it seemed like more of a hyped up american holiday party to me. Regardless, I had a lot of fun and would be willing to try it and other nations holiday traditions if given another chance. Interesting to learn about how Christmas is celebrated in another country. Sounds like the nativity scene and other religious-based traditions are popular. Did you get a sense that secular or American traditions were gaining popularity? If so, how did they differ from the U.S.? Do you have a sense as to how important Christmas is in Colombia compared to other holidays? In America, Christmas is the largest holiday by consumer spending, though I would guess Christmas in the States is way more commercialized than in Colombia. Are there other holidays celebrated in Colombia that rival or pass Christmas?